Fujita 5 Short Ram Intake - Dezod Motorsports Inc - Home of the automotive performance enthusiast since 2002. A traditional underhood intake, also known as a Short Ram Intake, usually follows the same path as the stock intake system. 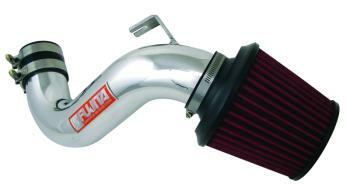 There are some distinct differences between the stock intake and the Fujita 5 Short Ram such as replacing the factory rubber intake with an aluminum plenum, eliminating resonators, air box, drop in filter, and replacing it with an open filter element. These key differences allow the vehicle to bring in more air into the intake chamber and create more horsepower and torque. Vacuum and in some cases air mass sensors, are still maintained and incorporated into the Fujita 5 Short Ram Intake. Since a vehicle is constantly moving (except during traffic or at a light) heat soak will be of little issue since the car will constantly be bringing in fresh air. In addition, studies have shown that the material used to build the intake system has shown no loss of horsepower due to an intake being rubber, aluminum, ceramic coated, anodized, etc. Each Fujita 5 Short Ram Intake system comes as a complete kit with all necessary hardware, instructions nad decals. NOTE: Normally stock colors are listed. However, per request, Fujita Air will custom color any intake kit in Wrinkle Black (B), Gun Metal (G) or Championship Bronze (CB) for an additional charge.